I had my first Pumpkin Spice coffee of the fall this morning. Sweet deliciousness I tell you. I was telling Mr. Broome this very thing when he said "Oh yeah? I had a vanilla latte at Starbucks this morning." He is just not a coffee man, nor can I imagine him having an easy time picking something off the menu at Starbucks. I asked him how he decided on that. "I just told them I wanted vanilla coffee." Sometimes we make things in life more difficult than they have to be. I am like that, Andy is not. He's straight forward and practical 90%of the time. I thought I was really rocking the chambray trend yesterday when in all reality you can call this shirt what it is. Blue jean. Nevertheless, I told Andy I was so envious of other gals style post that I needed to do my own. 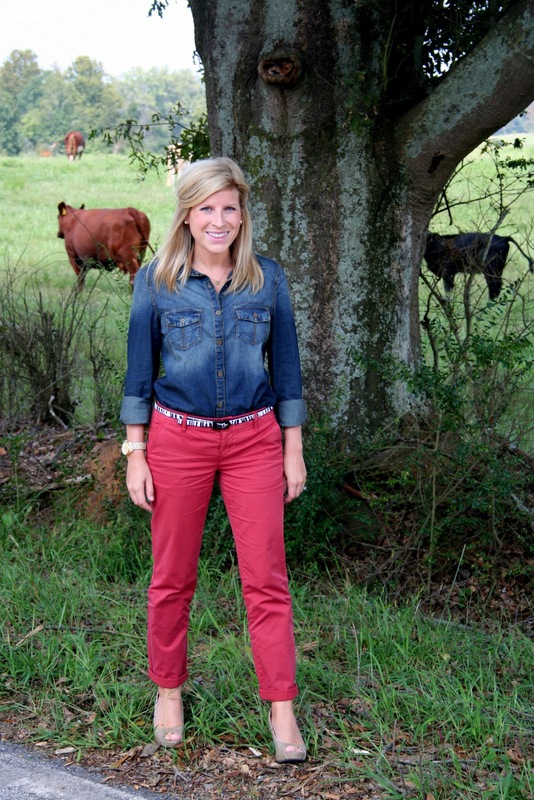 I'll spare you the other pictures because I'm not sure cows and fashion go together unless it's a cow print. Maybe the zebra belt ties it all in together?? See how difficult I can be? I'll try this out again sometime, maybe with less cows and more skills behind the camera. I had to share this giant of an elephant ear growing in our yard. It has been there forever, but never so big. I think cutting back the rose bush that grew beside it helped to give it room to grow. Ok, one more. I had to add this one. 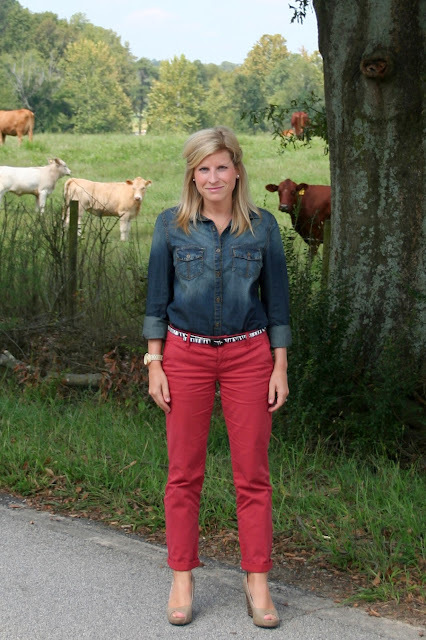 The cows, are all "Blue jean is so not chambray." You are right cows, you are right. Have a good weekend friends! Thanks for reading! ah! kirbs you are too cute!!! and i love love love the cows in the background.